The Singapore Airlines Group is accelerating expansion at full-service regional subsidiary SilkAir, which has quietly emerged as a strong competitor in a short-haul market dominated by low-cost carriers. While sceptics in 2004, when the Singapore market was revolutionised with the launch of three new LCCs, questioned whether SilkAir would be able to survive the onslaught of low-cost competition in its home market the small carrier has instead thrived as Singapore’s LCC penetration rate has exploded. SilkAir has steadily outperformed its LCC competitors, including SIA affiliate Tiger Airways, as well as SIA’s mainline operation. SilkAir is now preparing to undergo the biggest expansion phase in the 20-year history of the SilkAir brand. The SIA Group is planning to increase capacity (ASKs) at SilkAir by about 23% in the current fiscal year commencing 01-Apr-2012 (FY2013), outpacing the planned 3% capacity increase for SIA mainline as well as the expected capacity growth of the three main LCC groups serving the Singapore market: AirAsia, Jetstar and Tiger. Continued high double digit annual capacity growth is expected over the next decade as SilkAir’s fleet expands from 21 aircraft currently to a projected 54 aircraft by the end of 2021. The carrier earlier this month announced by far the biggest aircraft deal in its history, signing a letter of intent with Boeing to order 23 737-800s and 31 737 MAX 8s with purchase rights for an additional 14 aircraft. The expansion at SilkAir represents sound strategy for the SIA Group given that SilkAir has emerged as the most profitable brand (based on profit margins) in the Group’s four-brand portfolio. The SIA Group has turned to SilkAir to take over or supplement SIA’s intra-Asia routes, several of which have become unprofitable as LCC competition has intensified. As LCC competition has intensified, narrowbody aircraft have become more suitable for an increasing number of SIA’s regional routes. With SIA only operating widebody aircraft (the Airbus A330 is SIA’s smallest aircraft), the Group looks to SilkAir’s all-narrowbody fleet whenever there is a need to downsize a particular regional route. SilkAir also continues to expand by opening up new destinations for the Group, following its original model of serving smaller boutique markets that help feed SIA’s long-haul network. SIA, over the next decade, plans to continue rapidly expanding SilkAir in traditional SIA business-focused markets as well in traditional SilkAir markets, which are typically more leisure-focused. SilkAir’s lower cost structure is also a big advantage as the Group looks to improve profitability on short-haul routes. While SilkAir is by no measure an LCC or even a hybrid carrier, it has a much lower cost structure than SIA. Having the option of shifting some flying to a lower cost unit while maintaining a level of service sufficient for its long-haul passengers, including premium passengers, has been critical for the SIA Group as LCCs have quickly expanded in the Group’s home market of Singapore. SilkAir’s break-even load factor in the fiscal year ending 31-Mar-2012 (FY2012) was 59.7% compared to a much higher break-even load factor of 78% for parent airline SIA. SilkAir’s exceptional performance in challenging market conditions during FY2012 was no anomaly as the subsidiary has been profitable every year since FY2002. SilkAir, which at the beginning of the millennium struggled in the red while SIA was highly profitable, has now outperformed the rest of the group for three consecutive years based on operating profit margins. SilkAir recorded a SGD121 million (USD98 million) operating profit in FY2011 – its best ever result – and an SGD49 million (USD40 million) operating profit in FY2010. But the FY2012 performance was the most impressive in relative terms as SilkAir posted a 12ppt higher operating margin than SIA the parent airline and the overall SIA Group. SilkAir recorded an operating profit margin of 14% in FY2012 compared to a margin of less than 2% for the parent airline and Group. In FY2011 SilkAir recorded an operating profit margin of 18% compared to 7% for the parent airline and 9% for the SIA Group. SilkAir is still relatively small, accounting for only 6% of total SIA Group airline operation revenues in FY2012. But this figure will continue to grow steadily and should easily surpass 10% as SilkAir’s fleet more than doubles over the next decade while SIA’s mainline fleet expands only marginally. SilkAir’s portion of SIA Group airline operation revenues has already doubled in the last six years as the Group has expanded SilkAir to combat increasing LCC competition while mainline capacity has been flat. SilkAir generated SGD747 million (USD602 million) in revenues in FY2012, an increase of 117%, for an average of 20% per annum, compared to the SGD345 million (USD278 million) in revenues generated in FY2006. During the same period revenues at SIA the parent airline have increased only 17%, for an average of less than 3% per annum, from SGD10.303 billion (USD8.3 billion) in FY2006 to SGD12.070 billion (USD9.7 billion) in FY2012. SIA’s annual ASKs have increased by less than 4% over this period for an average of less than 1% per annum. The trend of SilkAir outperforming all SIA Group units on an operating margin basis is expected to continue into the new fiscal year. In the three months ending 31-Jul-2012 (1QFY2013) SilkAir recorded an operating profit of SGD18 million (USD15 million) compared to an operating profit of SGD85 million (USD69 million) at much larger SIA and a Group operating profit of SGD72 million (USD58 million). 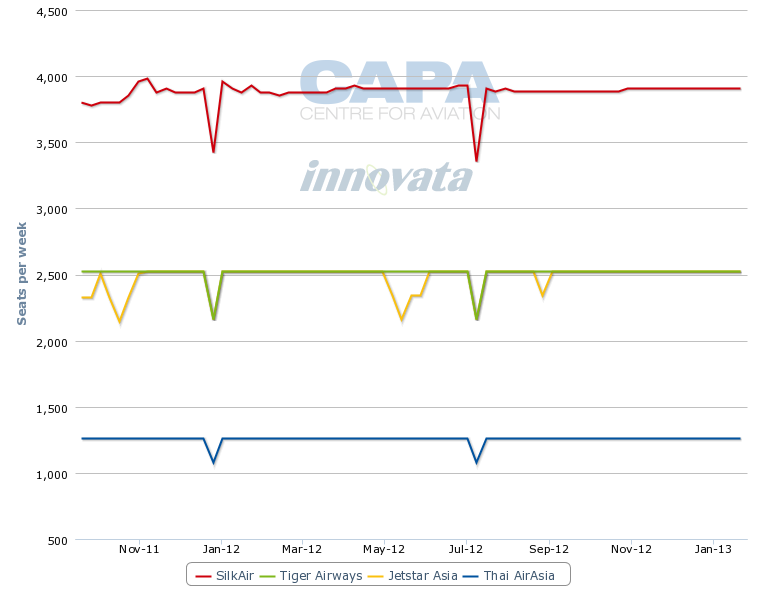 SilkAir also has steadily outperformed Tiger Singapore since Tiger’s launch in 2004. SilkAir has posted higher operating profit and operating profit margin every year since FY2007, the first year Tiger reported figures. Tiger joined SIA on the Singapore Stock Exchange with a separate listing that debuted in Jan-2010 (the two companies have the same reporting periods with the fiscal year ending in March). In FY2012 Tiger Singapore incurred an operating loss of SGD16 million (USD13 million), equating to an operating margin of negative 3%. While in FY2011 Tiger Singapore recorded a record profit of SGD54 million (USD44 million) and a record operating profit margin of 16%, both figures still fell short of SilkAir’s figures for FY2011. Note: Tiger figures only available from FY2007 but Tiger was in the red its first two years - FY2005 and FY2006. Tiger Singapore returned to the black in the three months ending 30-Jun-2012 (1QFY2013), recording an operating profit of SGD4 million (USD3 million). But SilkAir again easily outperformed its half sister Tiger in this latest quarter. The SIA Group currently owns a 33% stake in the Tiger Airways Group – which includes fully owned subsidiaries Tiger Singapore and Tiger Australia as well as minority stakes in new affiliate carriers in Indonesia (Mandala) and the Philippines (SEAir). The SIA Group owns 100% of SilkAir and new long-haul LCC Scoot. But Scoot has significantly more independence than SilkAir, which is run more like a unit of SIA with all major decisions including network made on SilkAir’s behalf by SIA. In 1QFY2013, SilkAir recorded a yield of SGD13.6 cents (USD10.8 cents), giving it a 79% premium compared to the SGD7.59 cents (USD6.02 cents) yield for the Tiger Airways Group (includes both Tiger Singapore and Tiger Australia as Tiger does not break down yield figures for its two units). This shows the full-service model is still a viable proposition in Singapore’s short-haul market as SilkAir is able to attract the premium traffic – with its two-class configuration and affiliation with SIA – to offset its higher costs. SilkAir’s unit costs in 1QFY2013 were 49% higher than the Tiger Airways Group, at SGD10.2 cents (USD8.2 cents) per ASK for SilkAir compared to SGD6.84 cents (USD5.52 cents) per ASK for the Tiger Airways Group. Tiger now accounts for about 8% of total capacity (seats) at Singapore, according to current Innovata data. SilkAir accounts for 6.5% of capacity at Changi Airport but its share of the Singapore market is expected to grow more rapidly over the next year than Tiger. SilkAir will also likely grow more rapidly over the next year than AirAsia and Jetstar, the two other larger Asian LCC groups that currently have a slightly larger share of the Singapore market than SilkAir. AirAsia currently accounts for about 7.4% of total capacity at Changi while Jetstar accounts for 7%, according to Innovata data. Tiger has decided to significantly slow down capacity expansion in the Singapore market in FY2013 after rapid expansion last year led to overcapacity, impacting profitability. Tiger Singapore grew ASKs by 50% in FY2012 while SilkAir grew ASKs by 12%. On a seat basis, Tiger Singapore capacity grew by 47% in FY2012 compared to FY2011 but Tiger has said its seat capacity will be up by only 7% in the current northern hemisphere summer season compared to summer 2011. Tiger is expected to pursue only marginal growth in Singapore over at least the next several months and likely over the medium term as it plans to allocate almost all of the additional aircraft coming into the group’s fleet to its new affiliates in Indonesia and the Philippines while keeping its Singapore fleet at 21 A320s. Tiger at this point does not believe the Singapore market is big enough to support a larger fleet although the carrier has been working this year on improving utilisation of its Singapore-based aircraft, which is resulting in the current modest growth in capacity. Jetstar also has slowed down capacity expansion in Singapore, including delaying plans to expand its Singapore-based Airbus A330 widebody fleet, after adding several narrowbody and widebody aircraft during 2011. The group says it currently has 16 A320s and three A330s based in Singapore with a 17th A320 slated to join the fleet in Oct-2012. Jetstar’s Singapore-based A320s are operated under the Jetstar Asia and Valuair air operators’ certificates. Jetstar Asia and Valuair both launched in 2004, joining Tiger in a suddenly crowded LCC market, but the two carriers merged in 2005, providing much needed consolidation. Valuair continues to operate several of the Jetstar Group’s routes in the Singapore-Indonesia market. The Group’s three Singapore-based A330s for now remain on the Australian registry and Jetstar’s Australian air operators’ certificate. AirAsia doesn’t have a Singapore-based affiliate or AOC but has been able to successfully build up a presence at Singapore’s Changi Airport that approximately equals Jetstar and Tiger by using its affiliates and subsidiaries from nearby Malaysia, Indonesia and Thailand. AirAsia’s new Philippine affiliate, which launched services earlier this year, will also likely serve Singapore in the short to medium term. But after several years of rapid expansion in the Singapore market, AirAsia has recently slowed down capacity growth at Changi. AirAsia has seen its capacity (seat) share at Changi slip over the last year from 8% in Aug-2011 to 7.4% in Aug-2012, according to Innovata data. Tiger’s capacity share grew during this period from 7.6% to 7.9% while Jetstar’s share has increased from 6.3% to 7%. Tiger and Jetstar have an advantage over AirAsia in that they can use their Singapore AOCs to access local traffic rights while AirAsia can only serve Singapore from Malaysia, Indonesia, Philippines and Thailand (although these are the four biggest LCC markets from Singapore). The rapid growth by AirAsia, Jetstar and Tiger at Changi Airport over the last eight years has led to a steady increase in Singapore’s LCC penetration rate. 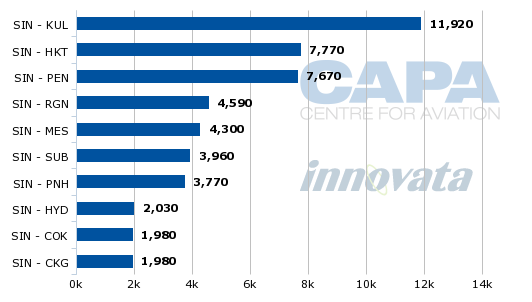 LCCs now account for about 27% of total capacity (seats) at Changi, compared to virtually zero in 2003. The rapid expansion of LCCs in Singapore has also led to congestion and infrastructure challenges as the fraction of narrowbody movements at Changi have increased dramatically. Changi is responding to the LCC growth by building a new fourth terminal which will replace the current budget terminal but has not yet made a decision on a third runway, which will be needed to support the growth particularly as a large portion of the growth (movements) over the next decade will come from narrowbody operators such as SilkAir and short-haul LCCs. The AirAsia, Jetstar and Tiger groups now account for over 80% of the LCC capacity at Changi and about 22% of the airport's total capacity. While LCCs overall still have a significantly smaller share of the market in Singapore than the SIA-SilkAir combination, LCCs have quickly built up a larger share than SIA-SilkAir on short-haul routes within Southeast Asia. In the Singapore-Southeast Asia market, LCCs now account for about 50% of all capacity compared to about 30% for the SIA-SilkAir combination. The SIA Group has increasingly turned to SilkAir to more effectively compete in the dramatically changed Singapore-Southeast Asia market. Using SilkAir on some traditional SIA routes within Southeast Asia has allowed the SIA Group to reduce capacity where there has been a huge influx of LCC capacity while maintaining and in some cases increasing frequency. SilkAir’s narrowbody fleet has also allowed the SIA Group to continue offering the same short-haul connections to its medium- and long-haul networks while lower yield point-to-point traffic has been absorbed by the fast-expanding LCCs. SilkAir also continues to play in the point-to-point market as less than 50% of its total traffic is transit but it tries to focus on the upper end of this market and does not typically match the fares of LCCs. SilkAir has steadily expanded its network, particularly over the last five years as LCC competition in Singapore has intensified. Since the end of FY2006, SlikAir has added 15 destinations, growing its network from 26 cities in 10 countries to a current 41 destinations in 12 countries. Back at the turn of the century, SilkAir only served 18 destinations in eight countries with a fleet of just seven aircraft. 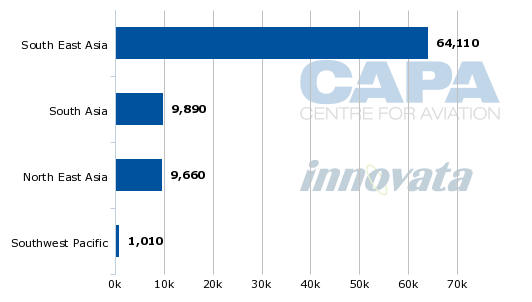 Southeast Asia is SilkAir’s largest market, accounting for 76% of SilkAir’s total capacity based on seats and 50% of the carrier’s capacity based on ASKs, according to current Innovata data (See Background Information). Southeast Asia accounts for 25 of SilkAir’s 41 destinations and eight of the 12 countries it serves (including Singapore). SilkAir now competes against LCCs on 14 of its 24 Southeast Asian routes. *Tiger is launching services to Phonm Penh in Oct-2012. SilkAir currently operates alongside SIA in two of its Southeast Asian markets: Kuala Lumpur (which SilkAir began serving in 2008) and Hanoi (which SilkAir launched earlier this year). SilkAir in 2009 also took over from SIA the Penang route, which was previously served with three daily SIA frequencies and is now served with four daily SilkAir flights. While SIA has only handed SilkAir a small fraction of its Southeast Asian flights, Kuala Lumpur and Penang are among SilkAir’s largest and most profitable markets. Singapore-Kuala Lumpur is SilkAir’s biggest route capacity while Singapore-Penang is the carrier’s third biggest route (See Background Information). While its biggest growth in recent years has come in the former SIA markets of Kuala Lumpur and Penang, SilkAir has been able to continue growing in several of its traditional Southeast Asian markets as LCC competition has increased. Phuket in Thailand represents the best example of SilkAir thriving alongside stiff LCC competition. Phuket is SilkAir’s second largest destination with four daily flights, giving it more capacity than any other carrier on the route and 38% of total capacity in the market. Singapore-Phuket is served by all three of Singapore’s main LCC groups, with Jetstar and Tiger each offering 14 weekly flights and AirAsia offering seven weekly flights. Singapore-Phuket is a leisure focused market which has grown significantly through LCC stimulation. But SilkAir has also been able to grow in Phuket as the island is a large and important destination for SIA passengers connecting off long-haul flights. While LCCs were able to quickly account for a majority of capacity on the route (Phuket was one of the first routes launched by Tiger and Jetstar Asia), SilkAir’s large presence in Phuket has proven the long-term viability of a cost effective full-service regional carrier model on short-haul routes from Singapore. SilkAir’s model also is able to support a larger number of destinations than LCCs. The 10 Southeast Asian markets which SilkAir does not compete with LCCs are secondary cities that generally lack sufficient demand to support regular point-to-point services, again indicating the strength of feed and brand (such as through frequent flyer points). In two of these 10 markets – Cebu and Chang Mai – LCCs competed against SilkAir until earlier this year, when Tiger and AirAsia respectively pulled out. This indicates SilkAir has a more viable business model on thinner routes where there is limited point-to-point demand. SilkAir has no competition from any type of carrier in eight of its Southeast Asian markets. In many cases, SilkAir is the only foreign carrier in these markets. SilkAir’s strong position in these relatively underserved markets result in high yields and feed for SIA which is unique to the SIA Group. SilkAir is expected to continue growing its Southeast Asia network as it expands its fleet. SIA could look to have SilkAir take over some of its frequencies in markets such as Denpasar and Ho Chi Minh. But there will also be opportunities to open up services to new secondary destinations in Southeast Asia, particularly in Indonesia. Indonesia has almost unlimited potential given the country’s booming economy and close ties to neighbouring Singapore. Indonesia is already SilkAir’s largest single market with nine destinations but there are several more secondary cities that could soon have sufficient demand to also support services to Singapore. Many of Indonesia’s secondary cities are booming and additional SilkAir services will help feed SIA medium- and long-haul flight as passengers from these cities look to avoid having to transfer in congested Jakarta. SilkAir will also likely boost capacity in the coming years in the four Indonesian markets it now serves less than daily. SilkAir outgoing CEO Marvin Tan has said that expansion from SilkAir will mainly come from the “big three” markets of Indonesia, India and China. He told CAPA earlier this year that the carrier plans to add at least two destinations in FY2013 – a mix of new and existing SIA Group destinations. SilkAir also already has a large and growing presence in India and China. The carrier currently serves seven destinations in China and seven in India although several of its destinations in these two countries are operated with less than daily frequency. The SilkAir strategy with China has been to open up new secondary destinations that have not traditionally been part of the SIA Group. SilkAir does not compete with LCCs in most of its Chinese markets. Only on Singapore-Shenzhen, does SilkAir face LCC competition. This could change, however, in coming years as Jetstar and SilkAir both look to add secondary destinations in mainland China. Jetstar already serves several secondary Chinese cities from Singapore but until now has focused on smaller destinations with no competition as well as bigger cities such as Beijing and Guangzhou that are served by SIA rather than SilkAir. SilkAir currently faces no competition on two of its seven Chinese routes. On four of these routes SilkAir competes with full-service Chinese carriers. SilkAir is typically able to attract higher yields than its Chinese competition given the carrier’s developed product and its ties to SIA. 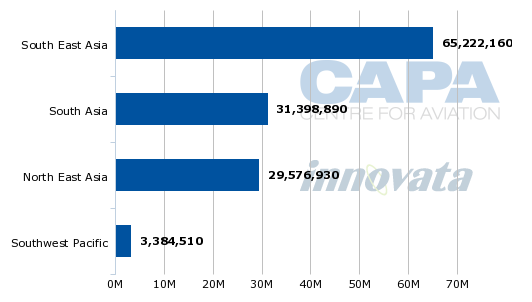 Notes: Capacity and capacity share figures based on schedules from Singapore for the week commencing 06-Aug-2012. 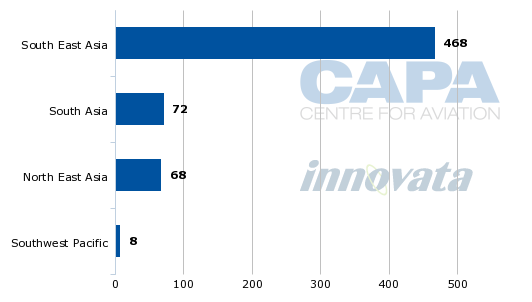 China currently accounts for 11% of SilkAir’s seats and 23% of the carrier’s ASKs, according to Innovata data. Four of its Chinese destinations are served less than daily while the other three destinations are only served with one daily flight. Unlike in China, in India the SIA Group has used SilkAir in recent years to take over and supplement traditional SIA routes. SilkAir now operates alongside SIA in the Bangalore, Chennai and Kolkata markets. SilkAir also has completely taken over the Hyderabad route from SIA while its other three Indian destinations – Coimbatore, Kochi and Thiruvananthapuram - are small cities in southern India which have always only been served by SilkAir. SilkAir also serves Kathmandu in neighbouring Nepal. 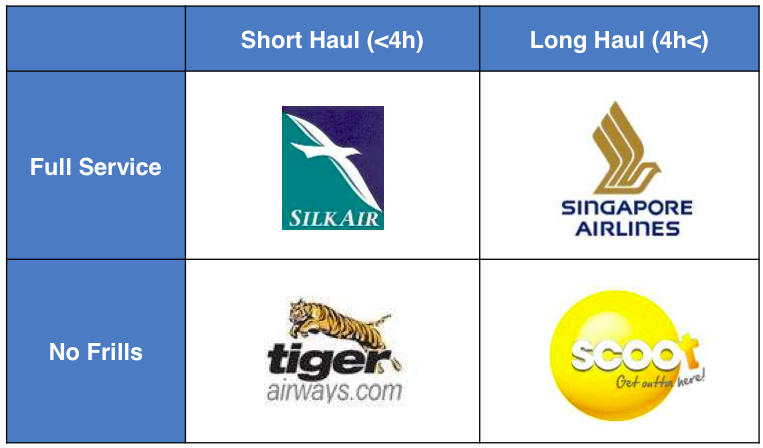 SilkAir faces LCC competition in four of its eight destinations in South Asia but Tiger is the only LCC in these four markets. (Tiger will compete in five of SilkAir’s seven destinations in India from 27-Sep-2012, when Tiger launches five weekly flights to Hyderabad). But the competition with Tiger is fairly negligible as Tiger is part of SIA Group and is firmly focused at the bottom end of the point-to-point market. Notes: Capacity and capacity share figures based on schedules from Singapore for the week commencing 06-Aug-2012. *Tiger is launching services to Hyderabad in Sep-2012. SilkAir’s expansion in South Asia in recent years has come not in response to LCC competition but as part of a strategy to offer more frequencies to destinations that were previously served less than daily. SilkAir’s India flights typically enjoy high yields and allow the carrier to increase aircraft utilisation as some of the flights have a back of the clock operation, flying in middle of night hours. South Asia currently accounts for 12% of SilkAir’s seats but 24% of its ASKs as its South Asian flights are among its longest routes (Singapore-Kathmandu is SilkAir’s longest flight at just under five hours). SilkAir currently only has one scheduled destination outside of Southeast Asia, South Asia and China: Darwin in northern Australia. Darwin was launched earlier this year and is operated four times per week during overnight hours. SilkAir competes on the route against Jetstar, which operates nine weekly frequencies between Darwin and Singapore. If successful, Darwin could lead to limited other new routes in Australia given SIA’s new tie-up with Virgin Australia. The introduction of the 737 MAX 8, which will offer improved range over the 737-800 or A320, could also open up potential new destinations in Australia such as Cairns or other points beyond SilkAir’s traditional South Asia/Southeast Asia/China network such as Busan in South Korea. SilkAir tells CAPA that its first 737 MAX 8 will be delivered in 2018. The carrier has committed to acquiring 31 737 MAX 8s between 2018 and 2021 but has the option of later changing some of its orders to the smaller 737 MAX 7 or larger 737 MAX 9. The 23 737-800s it is ordering from Boeing will be delivered from 2014 through 2017. The carrier currently operates 21 A320 family aircraft, two of which it took delivery of in Mar-2012 and Apr-2012, and is committed to acquiring three more A320s. Mr Tan told CAPA in May-2012 that of the three A320s SilkAir still has on order, one will be delivered in Nov-2012 and the final two during 2013. At the time Mr Tan said SilkAir was looking at new-generation narrowbody aircraft as well as regional jets as part of a tender for new aircraft that would be delivered starting in 2014 and be used for a combination of growth and replacement. Mr Tan will be replaced in Sep-2012 by current SIA VP of network planning Leslie Thng as part of the normal two-year rotation of SilkAir CEOs, which traditionally have come from the VP ranks of SIA. Mr Tan in May-2012 said that large regional jets from Bombardier, Embraer, Mitsubishi, Sukhoi and China’s AVIC were being considered for thinner routes to supplement its current and future narrowbody fleet. But SilkAir has since decided against acquiring regional jets, which would have been used to replace the A319s in its fleet as well as potentially open up new thinner routes that are too small for A320s or 737-800s. Regional jets would also potentially allow SilkAir to increase frequency on destinations in Southeast Asia that it now serves less than daily. Most of its China and South Asia destinations would not be within range of regional jet types. Since SilkAir phased out its fleet of 70-seat Fokker 70s in 2000 the carrier has looked at acquiring regional jets on several occasions. But it has repeatedly concluded that it makes the most sense to stick only with narrowbody jets, which offer lower unit costs but less flexibility when it comes to opening up secondary regional markets. SilkAir tells CAPA that “at this point we have no immediate plans to order smaller regional aircraft but we may revisit opportunities at the appropriate time”. For now SilkAir will focus on transitioning its entire fleet from Airbus to Boeing, a transition it is accustomed to, having operated Boeing 737 Classics prior to switching to A320s just prior to the millennium. SilkAir tells CAPA that the carrier anticipates phasing out its last A320 by the time its last of the 31 firm 737 MAX 8s it is ordering are delivered. With a projected fleet of 54 737s at the end of 2021 (and possibly more if purchase rights are exercised), SilkAir is poised for several years of rapid growth. The current fleet plan would provide a net addition of 32 aircraft from 2013 through 2021, which would provide average capacity growth of roughly 16% per annum over this nine-year period. Given SilkAir’s recent success and strong position in the intra-Asia market, where demand continues to grow rapidly, such expansion is clearly feasible. While the most rapid growth within Asia has been in the budget end of the market, the top end of this market also continues to grow as a portion of Asia’s population prefers not to fly budget carriers even on the shortest flights. SilkAir’s ability to offer an unmatchable range of long-haul connections (SIA has the largest European and Australian networks among Asian carriers) also gives it a competitive advantage over any other Asian full-service regional carrier. SilkAir is not a member of Star Alliance but this is largely seen as an intentional strategy from the SIA Group as passengers from Europe, North America and the South Pacific that are travelling to secondary destinations in Asia are more likely to use SIA for their long-haul flight rather than competing Star carriers because of the exclusivity of the SilkAir-SIA relationship. SilkAir has codeshare partnerships with a few carriers in the Asia-Pacific region (including Bangkok Airways, Garuda, Malaysia Airlines and Virgin Australia) but does not currently codeshare with any carrier from Europe or North America. SilkAir codeshares on all its flights with SIA and is part of SIA's KrisFlyer frequent flyer programme. The SilkAir-KrisFlyer relationship is key in building passenger loyalty, particularly from SIA's premium passengers and members of KrisFlyer's elite tiers. While passengers flying SIA can accrue miles on any Star Alliance carrier, on SilkAir flights these passengers can only accrue miles on KrisFlyer and not on any other Star Alliance-affiliated frequent flyer programme. While SilkAir has been successful for some time it has been a quiet overachiever given the challenges facing the broader SIA Group, which has seen signifcantly reduced profitability and virtually zero growth over the last several years. Until recently SilkAir’s success was not widely known partly because the SIA Group did not regularly report the unit’s operating and financial statistics (with the exception of the Group’s annual reports). But SIA over the last year has started regularly reporting SilkAir figures and talking up the success of its regional subsidiary. As SilkAir accelerates expansion and begins to expand even more rapidly than Singapore’s LCCs, it should finally start to get the attention it deserves. New-generation aircraft will also help raise SilkAir’s profile as well as expand its network as more secondary destinations in the key India and China markets are opened up. By early next decade SilkAir will likely be operating over 50 aircraft (compared to just over 100 at SIA mainline) and serving a network of more than 70 destinations, approximately matching the number of destinations served by SIA. As a result SilkAir will play an increasingly important role in the SIA Group as the Group looks to use a larger SilkAir and its new long-haul LCC Scoot to restore growth in Singapore after a challenging decade of little to no growth and rapidly decreasing market share. With the launch of Scoot and rapid expansion of SilkAir, Mr Goh’s SIA Group is opening a new chapter and making an important strategic shift. While somewhat controversial for a typically conservative SIA, the adjustment in strategy is absolutely required as SIA looks to maintain its leadership position in a rapidly changing marketplace.